The sun’s out – well sometimes – and it’s certainly time to dust off the shorts, slap on the sunscreen and head outside. But before you reach for your usual sun cream or lotion, why not try one of the ethical brands that are rising in popularity. There’s no need to scrimp on quality or performance, they’re great for you, good for the environment, and they’re easy on your pocket too. We all know the benefits of using a good quality sunscreen. Recent advances in sunblock technology have brought about a whole range of highly effective chemical and mineral sun filters, absorbers and reflectors to the market. There is a dazzling array of brands offering every kind of application, use and formulation helping to protect against burning, premature ageing and skin cancer. Whilst the products themselves are highly effective, a lot of the companies behind the biggest brands don’t focus hard enough on the things that matter to us all, including animal rights and the environment. Here at Ethical Consumer, we’re champions of ethical practice. We’ve produced reports on over 40,000 companies, brands and products on all aspects of ethical behaviour, and this year, we’ve turned our attention to sunscreens to bring you our top 5 ethical sunscreen products. Sunscreens contain substances that protect against both UVA and UVB radiation. Sun Protection Factor (SPF) is the measure of the protection against UVB radiation – which causes burning and is a factor in some skin cancers. The ‘star’ system that you see on the bottle is the measure of protection against UVA radiation – which is linked to skin ageing and skin cancer. A broad-spectrum sunscreen protects against both UVA and UVB rays and is the safest option. The British Association of Dermatologists recommends the use of a sunscreen with an SPF of at least 30 combined with a high UVA rating. There are two main types of active ingredients in a sunscreen – chemical sunscreens that absorb UV light, and mineral sunscreens which reflect the rays. Many products contain both mineral and chemical sunscreens, although some companies choose to use one over the other. Mineral sunscreens are the traditional and natural alternative, and the use of nano-particle versions minimise the white appearance of the lotion. Although there have been some concerns raised about nano-particles, so far there is no conclusive evidence that they cause a risk to health or the environment. Chemical sunscreens have been used more recently to deliver an easy application in a variety of sprays and liquids. Again, they have been declared safe for use on skin and have not be found to have any adverse effect on the environment. This exceptionally pure, 100% natural, ethical sunscreen is great for very sensitive skin, including babies and children. The mineral zinc oxide is the active ingredient, delivered in non-nano format, offering broad spectrum UVA and SPF30 UVB protection. Odylique’s formulation protects skin whilst actively caring for it with a mixture of nine organic botanicals, including Fairtrade raw shea butter and karanja seed to replenish and soothe, and a mixture of chamomile, rosemary and sea buckthorn to calm sun-sensitive skin. The light, non-greasy formula makes for easy application for immediate protection. In fact, this was the first sun lotion to be accredited as both Fairtrade and organic. We definitely take our ‘sun’ hat off to this ethical pioneer. Find it here at the Odylique online shop – prices start from £15 for a 50ml tube. Offering protection from UVA and UVB rays with a 100% mineral sun filter, this nourishing sunscreen can be worn instead of face cream in the summer months to offer SPF30 protection with up to 12 hours moisturisation. A rich blend of antioxidant-rich wild rosehip oil, nourishing shea butter and baobab oil is combined with the non-nano active sunscreen zinc oxide. With 50% organic ingredients, this cream is vegetarian society approved and accredited as Cruelty Free. Discover more at the Neal’s Yard online store where the product retails at £25 for 50ml. The Badger company offers a whole range of ethical sunscreen for every use, from an active sports range to scent free versions, baby and children ranges and even a DEET-free bug repellent version. Zinc oxide is the active ingredient in all Badger sunscreens in a non-nano formulation, offering broad-spectrum UVA and UVB protection with SPF ranging from 25-30, depending on the product. The all natural formulations include USDA certified organic ingredients and nourishing oils such as sunflower, extra virgin olive and jojoba. The formulations don’t clog pores and contain antioxidants such as vitamin E and sea buckthorn extract to protect the skin from free-radicals. If you’re looking for a wide selection of choice, including water resistant and tinted versions, then this is the brand for you. UK stockists include SO Organic. P rices start from around £10.77 for an 87ml tube. Vegan accredited and organic certified, Green People offers a range of ethically-minded sun lotions with broad-spectrum coverage in SPF 15-30. Based on nanoparticle zinc oxide mineral sunscreen, this rich lotion doesn’t clog pores and retains moisture to give a long-lasting smoothing effect. The standard 30SPF fragrance-free version contains 78% organic ingredients with sunflower oil, olive fruit oil and Fairtrade palm oil. Aloe vera, avocado, chamomile and green tea also form part of the active plant ingredients. A s well as offering baby and child versions, and a specific facial sunscreen, Green People also offers a tan accelerator range. The carob fruit extract naturally enhances the production of melanin, speeding tanning by 25% and enhancing the body’s natural defences. Visit the Green People website (<-affiliate link) to buy. Prices start from £5 for 30ml. Lush is well known for its innovative approaches to packaging and application with solid shampoo bars and bath fizzers, and the sunscreen is no exception. The solid block is made from a mixture of organic sesame oil and organic and Fairtrade cocoa butter combined with chemical sunscreens. You simply glide the product over your skin in the shower to apply the active ingredients, along with a fragrant mix of rose absolute, chamomile blue and eucalyptus blue oils. Calamine powder completes the formulation with a calming effect for delicate skin. Each 100g bar contains enough for three full body applications and costs £8.95. Visit the Lush website to buy online. Check out the full Ethical Consumer product guide to ethical sunscreen online, including the complete score table. See a large range of brands and how they compare on a whole range of ethical criteria, from the environment and animal welfare to supply chains, politics and sustainable practice. Green People, one of my natural skincare favourites, are celebrating 20 years of selling organic skincare and beauty products. From facial skincare to baby toiletries, to make up and sunscreen, Green People sell only organic and natural products and it’s been great watching them go from strength to strength over the years. As part of the celebrations they have launched a limited edition line of gorgeously scented Damask Rose products, which I’ve been trialing out. At the end of this post keep your eyes peeled for a special offer of a free Damask Rose moisturiser for you to try for yourself! The Damask Rose Moisturiser is a rich yet vegan friendly facial moisturiser, that’s 89% organic. Packed full of avocado oil, the cream is nourishing and naturally anti-wrinkle, without any parabens, lanolin, alcohol, artificial perfumes, petrochemicals, phthalates and colourant, so is suitable for those that may be prone to eczema and psoriasis. 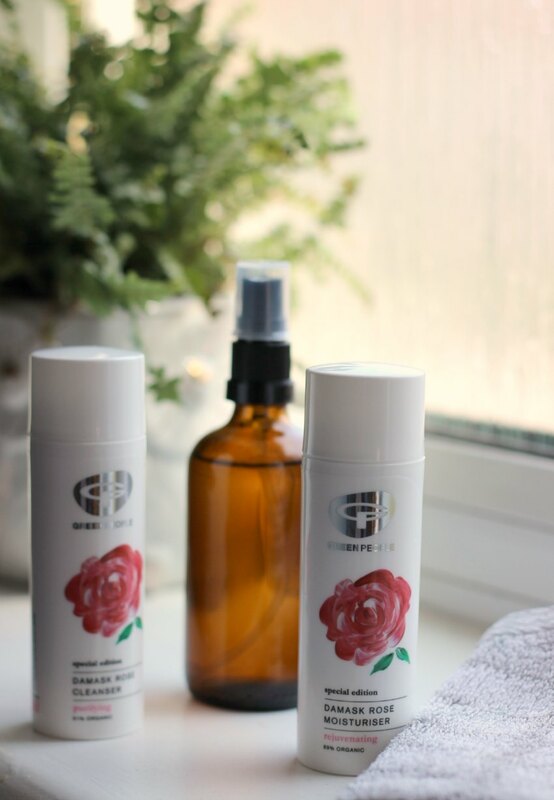 I’ve used Green People moisturiser for years (particularly this one), and the Damask Rose moisturiser is the same great quality I love with a lovely rose and jasmine scent that’s perfect for summer. I always feel the quality of their moisturisers is comparable with creams double or even triple the price, without the dubious ingredients. The Damask Rose Cleanser is again vegan, and 91% organic, and is effective at naturally removing make-up – even waterproof mascara. Packed with shea butter and jojoba oil, it moisturisers as it cleanses. I’m not normally a cleanser person but I have really enjoyed using the cleanser. My skin has felt nourished and clean, but not stripped, and again, the scent is just lovely. Finally, the Damask Rose Hand Cream has been a real treat to use. Vegan friendly, 91% organic, and suitable for those with sensitive skins, it’s rich and intensely moisturising but non-greasy. Formulated with shea butter, jojoba oil and aloe vera and scented with rose – it’s full of good stuff. I am prone to a bit of dry skin on my hands, and I’ve found this cream has helped. To celebrate their anniversary, Green People are giving away a 2 week supply of their limited edition Damask Rose Moisturiser free to all customers with every order over £5, whilst stocks last. Simply use the code AFROSE at the checkout so you can try it for yourself!